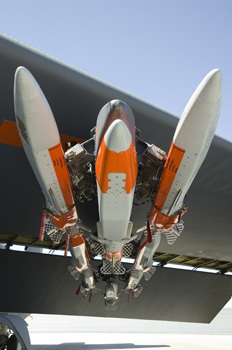 WICHITA, Kan., June 29, 2011 -- Boeing [NYSE: BA] earlier this month supported the U.S. Air Force in the first powered launch of a Miniature Air Launched Decoy Jammer (MALD-J) from a B-52. The successful test, in which the electronic jammer was launched from a B-52 Stratofortress, took place over the Gulf of Mexico at the Eglin Air Force Base, Fla., test range. Boeing designed the avionics software onboard the B-52 that controls and launches the Raytheon-built MALD-J. MALD-J is the newest variant in the MALD family. It has added capabilities to loiter or orbit over an area and jam adversaries’ radars. "This is another great opportunity for the Air Force and Boeing to transform the B-52 and expand its mission from a predominantly offensive role to a more defensive player, defending U.S. and allied aircraft in combat zones," said Oathout.